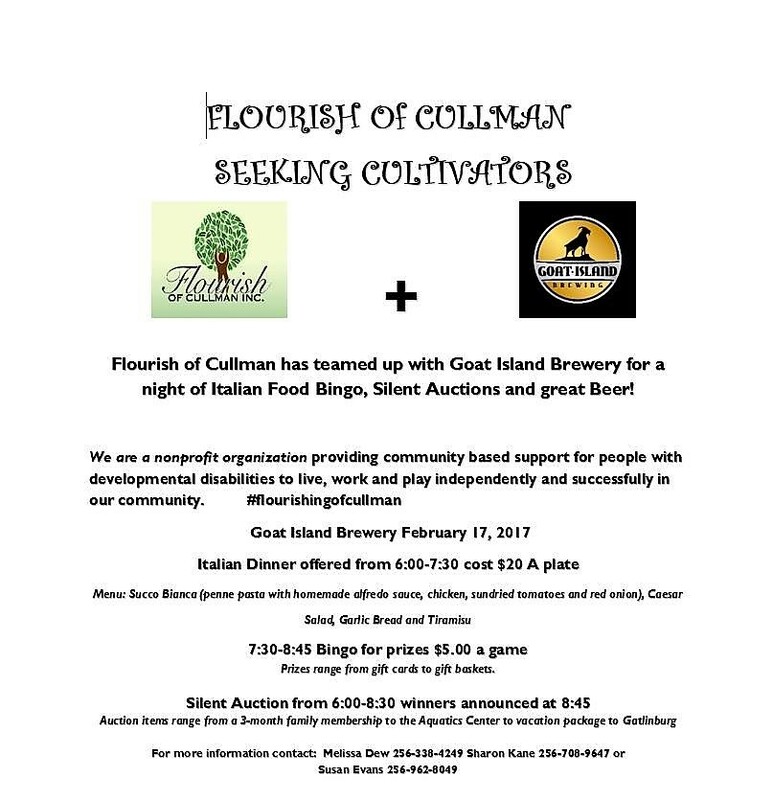 CULLMAN – On Feb. 17, starting at 6 p.m. at Goat Island Brewing, Flourish of Cullman will hold its first fundraising event since organizing in October 2016. The event, called “Flourish of Cullman Seeking Cultivators,” will include an Italian dinner, bingo, beer and a silent auction. The dinner will cost $20 per-plate, and the games of bingo will cost $5 per-play; silent auction winners will be announced at 8:45 p.m.
“We had been kicking around a lot of ideas and ending up pairing up with Goat Island Brewing because Susan Evans, a partner at Flourish of Cullman, has a cousin who co-owns Goat Island Brewing,” said Melissa Dew with Flourish of Cullman. Dew says she would like to see $20,000 raised on the night of the event, and said she has already sold 200 tickets. Flourish of Cullman is a nonprofit organization providing community-based support for people with developmental disabilities to live, work and play independently and successfully in our community. According to Dew, Flourish of Cullman aims to help those who are 16-years-old and older. Find out more about Flourish of Cullman at www.facebook.com/flourishofcullmaninc.